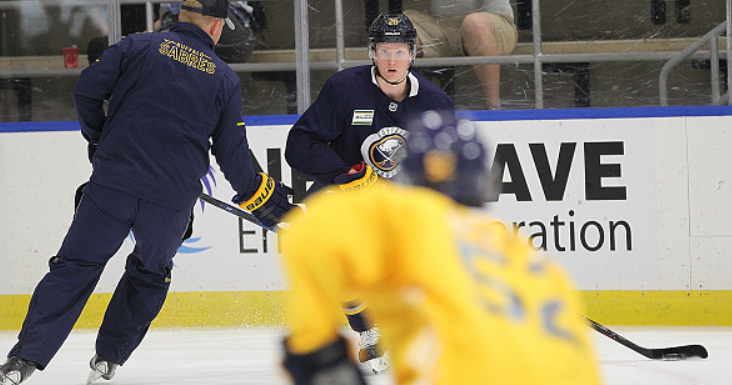 The Buffalo Sabres held their annual development camp this past week, followed by the 3 on 3 scrimmage. For some, this was the first chance to view Rasmus Dahlin, the highlight, in a game-like setting. Yesterday’s scrimmage results ended with 2017 1st round pick, Casey Mittelstadt‘s, group winning the tournament, again. Over 40 draftees, signees and invitees worked on skills, on and off the ice, while concluding the camp with some game simulation. Season ticket holders filed into the Harbor Center in downtown Buffalo to watch potential pros. Though not that close to an real game, the youngsters had the opportunity to show off. During the scrimmage, there were players who were no surprise. Brenden Guhle is a ridiculously fast skater and Casey Mittelstadt was showing Patrick Kane-like hands and quickness. Swedish center, Rasmus Asplund, who joins the Sabres organization this fall, continued to show strong hockey IQ and passing ability. Ukka-Pekka Luokkonen was solid in goal in his flashy orange pads and Will Borgen was solid on the blueline. No one should make too many strong conclusions but fans did view some traits that were lauded by scouts. Though not overly productive offensively, Rasmus Dahlin should other outstanding qualities. His skating is effortless as he dangled past the opposition without moving his feet at times. Defensive play was solid though someone stated he was a -5 (because we care about +/-). Dahlin showed his ability to process the game quickly though most of his teammates were not ready for some of his passes. Despite many chances, scoring was minimal but nothing to worry about. Adjusting to a smaller rink with less space will take time. 4th-round pick, Matej Pekar, was a pest. Prized for his energy and skating, the Miami of Ohio commit drove players nuts with his physicality and his mouth. He even antagonized Mittelstadt, nearly causing a fight. In an interview, he stated “he is not a skill guy” but likes to poke at the opposition. Many NHL fans will not like that he reveres the play of Brad Marchand though the Bruin has more offensive skill. I see his upside as Brenden Gallagher; solid production, two-way play, but can drive opponents nuts. Pekar did score a goal after making a nifty move on Dahlin, which was unexpected. I suppose this was revenge for Dahlin’s big hit the prior day. Lawrence Pilut speed and poise as advertised. Scoring a goal up the ice, the newly signed defender showed comfort jumping into play offensively and ability to return. He was the most noticeable player on Team Martin not named Casey Mittelstadt. Media and coaches commend Pilut’s skating though believe he will start in the American Hockey League to adapt to North American. I believe he will push the blueline greatly during training camp. 2016 7th-rounder, Vasily Glotov, displayed many desirable qualities. The centerman showed solid ability to possess the puck and make quick cuts on his skates. Glotov will get an opportunity in the minors this fall but he is still a long shot. There is effort to play both ends of the ice but he attempts passes that I am unsure he will perform regularly. Victor Olofsson’s shot is for real, scoring goals with his deadly release. A solid skater, the winger exhibits poise in the offensive zone while showing willingness to play defensively. Drafted in the 7th round in 2014, Olofsson has developed in the Sweden, including the SHL, Sweden’s top pro-league. There was never a reason to rush this player for the last four years and it may be one of the better decisions the Sabres have made. If he continues to complete his game, the late bloomer has a shot in Buffalo in two years. Who is Brandon Biro? Until last week, I had never heard of him. It turns out the Penn State forward has some wheels. Completing two seasons of NCAA, the forward was invited to Sabres Development Camp. In my opinion, Biro was the most noticeable. Though a slender build, the Nittany Lion has serious speed. On occasion, he blew by the opposition and potted a few pucks. Undrafted, the Sabres will be keeping an eye on him as he is likely to return for his junior year. Having a Penn State Alum as an owner does not hurt. There were a few names not participating on the ice. Alex Nylander, Marcus Davidsson, and Oskari Laaksonen were not on ice this past week with nothing truly confirmed. Nylander and Davidsson were reported as dealing with ailments while there was speculation Laaksonen could have military obligations in Finland. Laaksonen (3rd round, 2017) has been invited to World Junior Camp for his home country this summer. As an intriguing prospect, an apparent “off the board” pick, it would have been nice to seem him. A couple of players were just not noticed. The latest 2nd rounder, Mattias Samuelsson, and Jacob Bryson, were notably invisible during the scrimmage. I cannot say a smelled a wiff of them on the ice and cannot confirm whether they were inactive or if they did not stand out. Bryson had a strong year at Providence, claiming multiple all-star awards in NCAA hockey. Samuelsson, off to Western Michigan, is complimented as a snarly defender with outstanding leadership and decision making. If they were skating, nothing caught my attention. I will continue to observe their development. For my latest hockey updates and content, follow me on Twitter. Check out the other great contributors at the 4th Line Podcast.